Genuine Subaru Accessory. "Subaru" License Plate Frame (Matte Black). Manufactured from heavy-guage 304 stainless steel that will not rust or corrode. 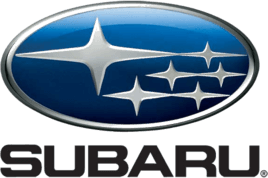 Available in polished stainless steel or matte black finish with Subaru logo. Kit includes hardware hider caps.